On January 29, 1979, Deng Xiaoping, the initiator of China’s Reform and Opening-up Policy, began his nine-day visit to the United States of America. Seen as a milestone that opened the door for mutual exchange and cooperation between China and the US, the visit came less than a month after the Sino-US relationship became normalized on January 1 and was the first time that a national Chinese leader visited America since the founding of the PRC in 1949. Given its historic significance, both countries attached great importance to the ‘ice-breaking’ visit. According to CCTV, in order to make sure the visit would go as scheduled, Deng insisted that his flight should take off against the advice of the Protocol Department of China’s Ministry of Foreign Affairs, who said that, due to bad weather conditions, the flight should be postponed until it was safe enough to fly. On the other side of the Pacific, the White House prepared a series of head-of-state-level activities, including a state dinner, to welcome Deng, despite the fact that he was still the vice premier of China at the time. Americans were deeply curious about this powerful man, who was a national leader of a long-isolated country and had played a major part in many of the PRC’s historical events, such as the Long March, China’s Civil War and the debut of the Reform and Opening-up Policy, which had launched a year earlier. 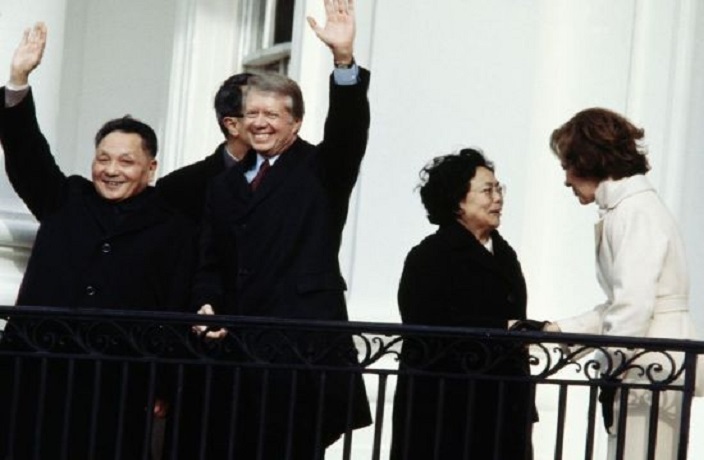 Deng was welcomed at the White House by President Carter, with whom he would have three official meetings before heading to Atlanta, Houston and Seattle. While some still view the visit as a sign that China once wanted to seek an alliance with the US against the Soviet Union, Xinhua points out that the visit was to pave the way for the country’s Reform and Opening-up Policy and its modernization. According to Xinhua, prior to his trip to America, Deng said that one of his country’s aims was to boost China’s modernization by learning from the US, whose industrial and technological development was the most advanced in the world (and learn he did!). After leaving Washington D.C., he visited a Ford manufacturing factory in Atlanta and was amazed that they could produce 50 cars per hour, when, at the time, China was only able to manufacture 13,000 a year. He then visited Johnson Space Center in Houston before leaving for Seattle, where he toured an assembly line for Boeing 747 planes. However, this historic visit wasn’t all plain sailing. Due to ideological differences on a number of issues, the delegation was faced with anti-China sentiment a number of times during the visit. According to People’s Daily, one such incident took place at the Chinese liaison office in Washington D.C., where a group of people showed up in the middle of the night four days prior to Deng’s visit and broke the entrance glass with a paint bucket. During President Carter’s speech at the welcoming ceremony held at the South Lawn of the White House, two protesters were taken away from the press area after chanting anti-China slogans. According to Financial Times, there was even an assassination attempt on February 2 in Houston by a Ku Klux Klan member, who reportedly pulled out a knife and rushed to the podium where Deng was speaking. He was intercepted by Paul Kelly, a US Secret Service agent. Deng’s short visit concluded on February 5. However, it ushered in a whole new era for the Sino-US relationship, while also showing China’s determination to open up to the outside world. “The opening up to the outside world tied in with the normalization with the United States. It’s been a remarkable achievement… whereas in the past, China had no relationships at all,” said President Carter in an interview with CGTN. For more This Day in History stories, click here. On January 31, 1979, the Chinese government agreed to establish the Shekou Industrial Zone. The first and only Chinese head of state to use a Western name. The ad men follow on from the mad men.